Deal for Gurinder Chadha and new film,‘Blinded by the light’ – $15 million (£12m) deal confirmed Warner Bros and New Line – global, not UK, France, Australia (eOne) and Japan (independent). We have an extensive interview with Chadha and will publish ahead of a UK release, expected to be in the summer. Deal for Mindy Kaling (writer) and Nisha Ganatra (director) for ‘Late Night’ $13 million (£10m) deal with Amazon Studios – it will get a theatre release too and strategy may resemble that for ‘The Big Sick‘ which got £9m deal from Sundance last year. London based Richie Mehta signed a deal with Netflix just before world premiere of ‘Delhi Crime Story’ now referred to as just ‘Delhi Crime‘. Seven part series will be available on platform from March 22. We have interviews with Mehta, lead actors Shefali Shah and Rasika Dugal who travelled to Sundance with Mehta, along with producers and other people who helped to make the films. Reports of second series already commissioned. ‘Hala’ – US coming of age drama with a Pakistani American girl at the centre of it and directed by Minhal Baig and executively produced by Jade Pinkett Smith (Will Smith’s wife) is snapped up by Apple Studios. No further details at the present time. Lulu Wang the Chinese American director behind ‘The Farewell‘ which had its world premiere at Sundance. It chronicles the tale of a grandmother, dying of cancer, unknown to her, but returning to China from the US for a family wedding/reunion. The film has reportedly beeen sold to A24 for worldwide distribution rights. The film stars Awkwafina, a well-known US actor and rapper. 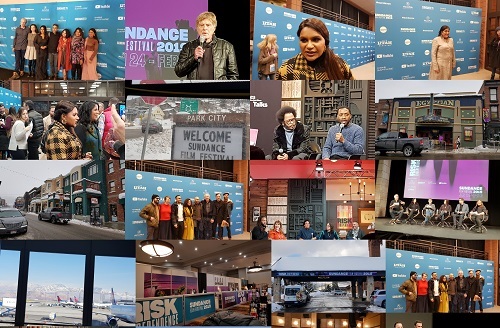 Gurinder Chadha at the Sundance Film Festival 2019 – interviews with Chadha, writer Safraz Manzoor and lead actor, Viveik Kalra and excerpts from post screening Q&A, following its world premiere there. For reviews of award-winning films, ‘Knock down the house’ and ‘Queen of hearts’ here along with other reviews from Sundance. (You can see video of awards ceremony there too).